any person having in their possession or under their charge an animal affected or suspected of having one of these diseases must, with all practicable speed, notify that fact to a police constable. Commercial flocks are vaccinated against Newcastle disease at the same time as they are vaccinated for infectious bronchitis and all racing pigeons leaving the UK (and returning on their own hopefully!) are vaccinated against it. The virus is quite tough, being able to survive in dead birds for many weeks afterwards. Species Affected: All but especially turkeys and chickens. Symptoms: Can be quite varied. In growers: Gasping, coughing and wheezing / chirping. After a couple of weeks, sometimes nervous system problems – twisted neck, droopy wings, dragging legs. 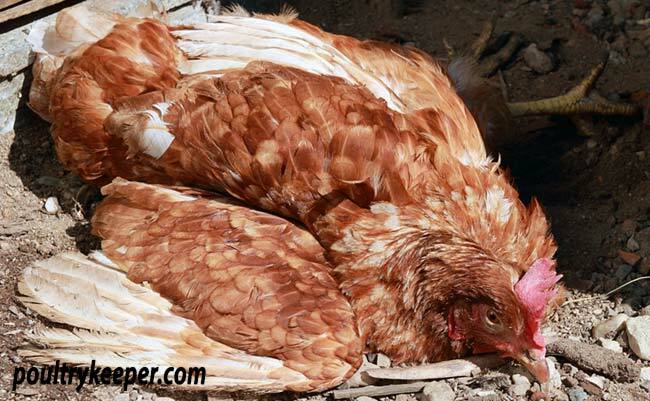 In adults: Wheezing, emarald green droppings, soft-shelled eggs or drop in egg production and later on, nervous system symptoms such as twisted neck, droopy wings, dragging legs. 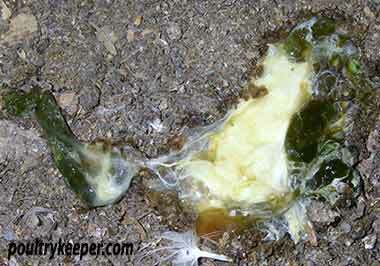 Emerald Green Diarrhoea from a chicken with Newcastle Disease. Transmission: By inhaling the virus via respiratory discharges from carriers or ingesting it via excretions e.g contaminated feed. Diagnosis: Symptoms above and post-mortem findings. Prevention: Vaccination (Intervet) if in a high risk area, good biosecurity. Treatment: Isolate infected birds in a warm location, provide them with a good diet and a vitamin supplement in their water. Risk to Human Health: Infection to the eyes / conjunctivitis with flu-like symptoms. Usually temporary and should clear after a couple of weeks. Tip: The tags under the related articles below allow you to view other articles on diseases with those symptoms.